Benedict's main achievement is his "Rule of Saint Benedict", containing precepts for his monks. It is heavily influenced by the writings of John Cassian, and shows strong affinity with the Rule of the Master. 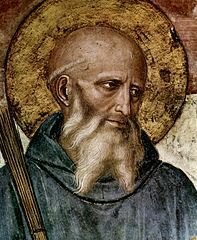 But it also has Benedict of Nursia (Italian: San Benedetto da Norcia) (c. 480 – 543 or 547) is a Christian saint, honoured by the Catholic Church and the Anglican Church as the patron saint of Europe and students. Is this you? Let us know. If not, help out and invite Benedict to Goodreads.